The Speedmaster Ford Cleveland 3v heads are a perfect upgrade for both 2 and 4 barrel engines. We have re-designed the intake ports by raising the floor to help cut down on the massive cross-section that hampers OEM 4 barrel heads. Not only do you get more performance out of the box than OEM heads, our heads are significantly lighter since they are made of Gravity Die Cast aluminum. As another benefit, you can run higher compression with aluminum heads before the onset of power robbing detonation. 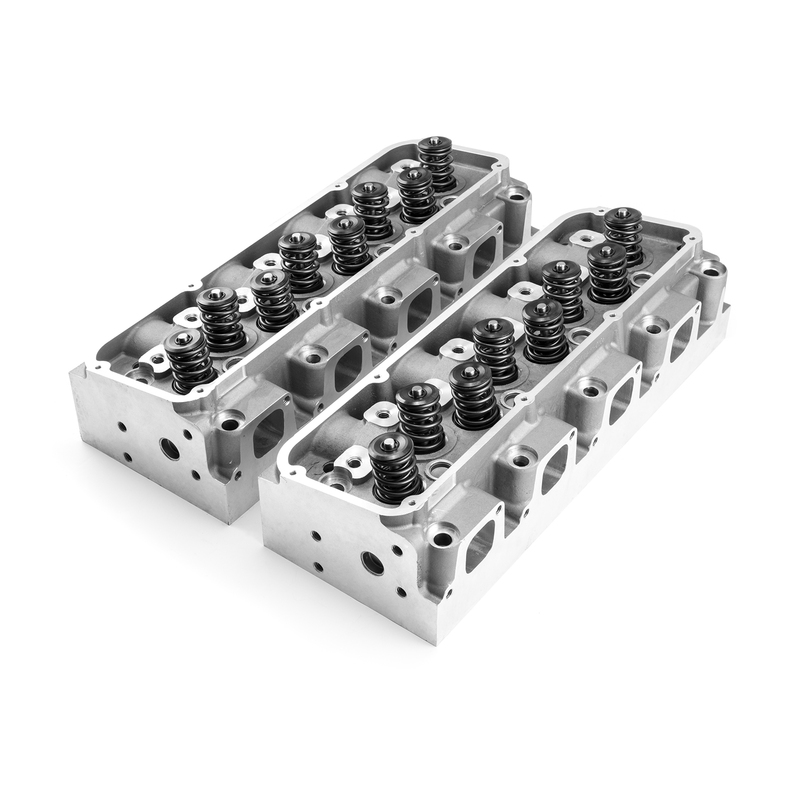 There is absolutely no reason to rebuild a set of OEM castings when you can buy a lighter, higher flowing and more detonation resistant cylinder head for less money from us! To top it all off, we offer CNC ported Cleveland heads for people looking for even more performance. Due to the unique raised port of the Speedmaster 3v head, the only intake gaskets readily available are Speedmaster SM3282 which measure 1.73(W) x 2.140(T) with the floor of the port 1.220 up from the deck of the head. The exhaust side of the head uses standard 4v exhaust gaskets. You can use Speedmaster SM3274 or Fel-Pro 1416 header gaskets which measure 1.89 (W) x 2.19 (T). Both gaskets are .040 thickness when compressed. The Speedmaster Cleveland 3v heads require specific head studs that are longer than standard. These studs should only be finger tightened into the block. Torque the nuts to 65lbs. using high pressure moly lube, in increments of 15lbs. Remember that you need a COLDER plug when you make more power, ie. N2O, Turbo and supercharging.